Longest Acres Blog: a lady, her farm, and her cake. a lady, her farm, and her cake. i present to you, lady mckenzie and her charming farm blog oliver and abrahams and her white cake. a very fuzzy ipad photo of the last piece of white cake. eaten during a garden-planning morning hour. mckenzie reached out to me through longest acres a couple of weeks ago, i in turn visited her at oliver and abrahams and we have been emailing back and forth ever since. meeting other farm/blogg women has a much coveted Small World feeling to it. to expand my farming community through this avenue makes me feel less overwhelmed, less alone in this life choice. just like meeting louisa through icelandic butterflies. i can talk to them, gripe to them, complain to them, ask questions of them in ways that i cannot with even my closest friends and family. they understand the intricacies of farm life that nobody else could understand, no matter how best i try to describe them. and so, i am so very grateful for such women in my life. i hope some day i am able to visit mckenzie at her farm, and she at mine. but for now, i....we...must be content with her beautiful blog. mckenzie answered my Call for Cakes last week with at 1964 joy of cooking recipe known as the "white cake". "This recipe is amazing in that it can be multiplied by 8 and still give as good a result as when made in the smaller quantity below... We once saw a wedding cake made from this recipe which contained 130 eggs and was big enough to serve 400 guests. This formula is also the classic base for the Lady Baltimore Cake which in the Good Old Days, 5 layers were considered none too many." Add the sifted sugar to the butter gradually and continue creaming until very light. Add the flour mixture to the batter mixture in 3 parts, alternately, with thirds of 1 cup whole milk. Stir the batter until smooth after each addition. Beat in 1 tsp vanilla (I also used a couple tsp of almond extract, which I think made it much more awesome). Whip 7 or 8 egg whites until stiff, but not dry. Fold them lightly into the cake batter. Bake in greased and floured pans for about 25 minutes, or until done. For icing, I kind of improvise. I cream about two sticks of room temperature butter (unsalted) and slowly add powdered sugar until its the consistency I like. usually this takes one full bag. Makes a lot of icing, but we have lots of invading fingers around here... I also add a couple tablespoons of whole milk while mixing in the sugar. Then I add a few splashes of vanilla and almond extract. Until it's good, basically. " it was scrumptious. i made just one layer as we are not in the position to be throwing 7-8 eggs into one cake. neither are we in the position to be eating multiple layer cakes. but it was good even in its smaller self. nick sat down and, bless him, said that it was a good 'every day' kind of cake. i suppose he is ready for the year of cakes. all photos, save the last of the cake, are from mckenzie's blog. lindsay! first off, congratulations on the first egg! are they your own chickens? or the farm's chickens? a green first egg must certainly mean good things. second, yes, egg shells to give your chickens a little needed calcium boost. makes their shells stronger. 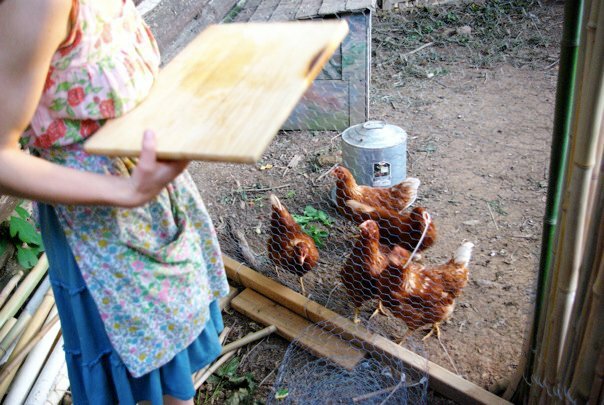 you crush the egg shells up before giving them back to the chickens. this way they don't ever associate the shape of the egg with a delicious treat or you will find yourself with egg-eating chickens. an awful mess. I love that you found a like-minded blogger to connect with! I am very curious if you use those eggshells for something. And I love those bright red eggs!! I love your blog, whole-heartedly love it. on the subject of cake. and pigs. a 24 hour span with my love. ringing it in with the good and the bad.